It appears that the book about iced tea is Fred Thompson's Iced Tea: 50 Recipes for Refreshing Tisanes, Infusions, Coolers, and Spiked Teas. The book was featured on NPR in 2002. You can find lesser known titles on Amazon using the search term "iced tea." 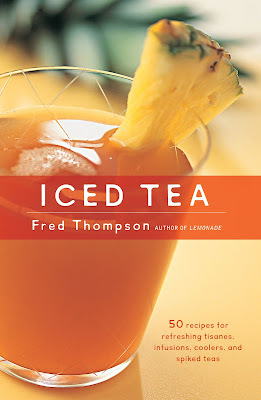 Takeya has published an an iced tea recipe book for its Flash Chill Tea Maker. Stash Tea has published a beautifully photographed summer tea recipe e-book titled Ice Days Ahead.